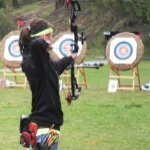 On this page you will learn about the Follow Through which is the tenth and final basic archery step of the shot sequence. In this step you will learn the proper way to finish the step of releasing the arrow. While you already committed to making the shot in the release step, the execution of the shot is not complete. Archery is no different than other sports that involve swinging a bat, club or racket. It is also similar to kicking or throwing a ball. The follow-through in archery controls the release step by allowing the energy of the bow and the tension in the drawing arm to naturally expand. The follow-through is not a series of static positions like a dead release - It is a smooth, free-flowing motion that carries the weight of the bow and the drawing arm to the full finish position. Remember, the release must be executed cleanly in a single smooth action, but the follow-through is the actual finish. The release and the follow-through are really a single fluid action and when performed correctly will yield superior results. • Once you have began the release process you must be fully committed to completing the shot. • Before beginning the release and follow-through you should have paused for a few seconds to quickly evaluate your overall shooting form. After committing to the release, the fingers of the drawing hand should be relaxed. Continue to engage your back muscles so the scapula continues to move toward the spine and the drawing arm shoulder rolls around toward your back. Your drawing hand should move straight back along the side of your face and stop slightly below and behind the ear. The bow arm should continue to hold the bow up and remain in this position until the end of the follow through. Continue to apply back tension until the arrow hits the target. Lower the bow arm and drawing arm and rest. Beginning archers have a tendency to do one of two things. Move the bow to the left or right so they can observe the flight of the arrow (Peaking). If you drop the bow arm too soon and the arrow has not cleared the arrow rest we are essentially driving or steering the arrow down off course. Lowering the bow arm to soon will typically cause the arrows to impact below your point of aim. If you are peaking (moving the bow to the left or right) to watch the arrow flight and the arrow has not left the arrow rest or cleared the riser then you are simply steering your arrow to the left or right of your original point of aim. The follow-through also reduces some of the shock and vibration that is transmitted from the bow back through your arm and shoulder. A good clean follow-through will reduce the amount of fatigue that you experience during long archery practice sessions and competition. Conversely, the follow-through should not be an overly exaggerated action or overly dramatic motion. It is a smoothly executed and controlled movement. 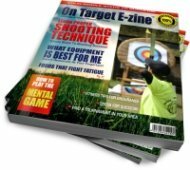 Mastering the follow through will assure a pleasant shooting experience and increase your consistency and accuracy - that being the whole point of archery. Do You Have A Question About The Follow-Through Step?